2014 Club Car Precedent Golf Car (Electric) Call (479) 621-9494 for more details! 2014 Club Car Precedent Golf Car (Gas) Call (479) 621-9494 for more details! SPECIAL* 2019 Yamaha Adv. Sport 2 + 2 Golf Car (Electric) Lifted! Aluminum Specter Wheels, USB Ports, Brush Guard, Fender Flairs, Fold-Down Seating Windshield, Extended Canopy Call (479) 621-9494 for more details! 2012 Club Car DS Golf Car (Gas) Gas Model 2 Passenger Aluminum Cargo Box Windshield Excellent Condition Call (479) 621-9494 for more details! 2012 Club Car DS Golf Car (Gas) Lights Cargo Box Clay's Front Basket Unit 2 Passenger Call (479) 621-9494 for more details! 2014 Club Car Precedent Golf Car (Electric) NEW LED Head & Tail Lights. Great Body, Tires and Sets. Fold-down Windshield Canopy Automatic Charger Call (479) 621-9494 for more details! New! Yamaha Electric 2+2 (2019) (Jasper - Red) New! Lifted with Aluminum Specter Wheels! Battery Gauge USB Ports Brush Guard & Fender Flairs Fold Down Seating Windshield & Extended Canopy Call (479) 621-9494 for more details! Color: Black Rhino 3" Lift w/ A/T Tires 10" Steel Wheels Roll Cage Light Bar Front and Rear Brush Guard Rhino Body Club Car DS w/ Cage Golf Car Call (479) 621-9494 for more details! Color: Blue New Blue Body New Blue RHOX Wheels and Tires Fold Down Windshield New Fold Down Seats Black Canopy 2014 Club Car Precedent Golf Car Call (479) 621-9494 for more details! Color: Red New Rear M&M Seats New Extended Top Kawasaki 350cc Engine Great Seats and Tires Call (479) 621-9494 for more details! 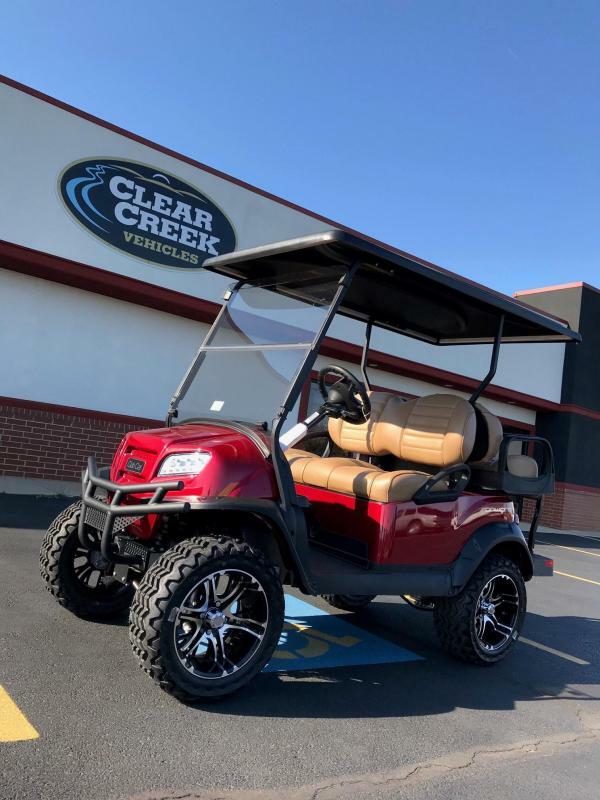 Color: Red LED Lights Sand Bottles Club Cover Cooler New SS Hubcaps Great Seats and Tires Fold Down Windshield 2014 Club Car Precedent 2 Pass Golf Car Call (479) 621-9494 for more details! Color: Beige 10" Aluminum Wheels Fold Down Windshield Extended Black Canopy USB Ports Full LED Lights with Turns Premium Seats Cooler Call (479) 621-9494 for more details! Color: Red Lifted 14" Aluminum Wheels Fold Down Windshield Price Includes Extended Canopy Cooler USB Ports Full LED Lights with Turns Brush Guard Fender Flairs Premium Seats Call (479) 621-9494 for more details!